I’m beginning a new Java tutorial using Eclipse as my IDE. Every time I have used Eclipse in the past there have been installation problems so, I’ll try to fix that issue here. 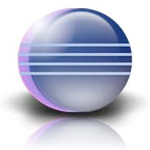 I use Eclipse because in my opinion it is the best free IDE available. Also note that I’ll provide Java 1.7 installation steps for PCs, but Java 1.6 & 1.7 steps for MACs. The reason why I’m doing that is because Java 1.7 isn’t quite ready yet for Eclipse on MACs. Don’t worry, there isn’t that much of a difference between Java 1.6 and 1.7. At least for a beginner tutorial. If you don’t have Java 1.6 installed for Mac go here to get it. You can get a preview release of Java 1.7 for Mac here. Now that you have Java setup on your Mac, it is time to set up Eclipse. Go here to download the Eclipse IDE for Java Developers. After you install Eclipse you have to set it up to work with Java. For PCs go here to download Java 1.7 unless you already have it installed. Make sure you download the JDK and not the JDE. Find the Java executable you just downloaded and double click it. Follow the prompts to install it. The Java files will be located at C:\Program Files\Java\jdk1.7.0 after installation. To get Eclipse to work on PCs is nearly identical to the MAC installation. Go here to download the Eclipse IDE for Java Developers. 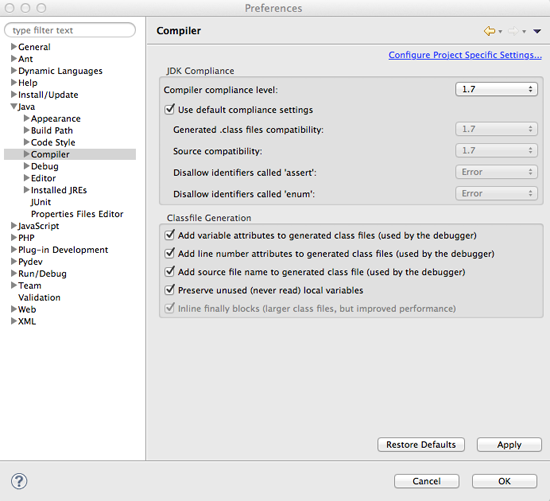 To set up code completion for Java 1.7 in Eclipse just open your preferences folder, click on Compiler, and set Compiler Compliance Level to 1.7. This currently isn’t working for MACs, but should work soon. If you have a PC this will work. See image below to better understand the change. I hope this tutorial helps you to easily install Eclipse, so you can use it to learn java. Leave any questions below. That’s perfect to me. it coudn’t be better because i was wondering witch application language i have to learn to make somme counting applications. i found that java was the perfect language and quiet frankly i was going to ask you witch to help me choise betwen android and java or purpose to me another language to made some pc applications. i am a lucky gay derek to know you. sometimes it is enough that I think of something for you to give me the answer. i am in. Java is pretty much the language of choice for developing applications for any OS. I’m not sure what I’m going to do. I basically want to try and cover the basics in an understandable way. Thank you very much 🙂 You’re very kind. May God bless you and your loved ones as well. thanks, bro would u please help us to know about visual basic programming? Sorry, I don’t have a PC. Mine broke 🙁 I’ll look into whether I can get ahold of a compiler for Mac? is it possible to make a chat application with php ? I don’t know which version of Eclipse to download. There are many. Which one are you using? Why when I goto … File> new I get ? I recently downloaded Eclipse ee for java developers. I am only using 1.6. I dont see a need to hassle with 1.7 due to my newness of programming. I cant assume i have done anything wrong because I just installed it and have not messed with anything. May I please request your kind help with installing Eclipse on Ubuntu 12.10 32-bit. I resorted to a Linux distro because my PC repeatedly chrashed under Windows XP Home Edition. I am most grateful for your kind help and advice. I tried downloading the file eclipse-java-indigo-SR2-linux-gtk.tar.gz.part twice. Each time the error said that it could not be saved. I checked that that the file size donloaded was 128.9 MB. The extraction of this file failed, but the error was not specified. Kindly advise, if possible to help me continue jearning Java from your most excellent quality tutorials. Thank you very much for your most kind help with the Eclipse download. Your instructions have worked well giving me the much needed chance to put in some practise. I am practising with your very helpful code from Tutorials 1, 2, and 3. Sometimes Eclipse detects dead code, though it compiles and runs as expected. Thank you once again for your highly considerate Java Tutorials anlong with your continual help. Good wishes to you and best regards, too. You’re very welcome 🙂 I personally could never do what I do on a laptop, but my work may be very different from yours. I use a 27″ iMac and it has made me extremely productive. Very often I have to maintain inventory while taking notes and monitoring data in a browser. I can easily do this and much more on a desktop. If you normally only do one thing at once, or value portability over all else then a laptop is the way to go for you. As per moving toward Macs for development I personally haven’t upgraded my osX because the os is becoming more of a toy versus the amazing development tool that it once was.